Speedy Chile "Fast Flowering" has been bred for those who hesitate cultivating autoflowering varieties due to the sometimes lower THC level. 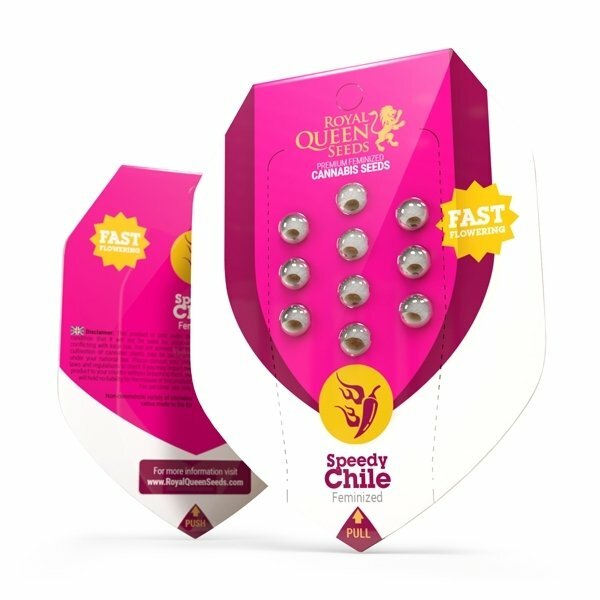 To convince the last hesitator, Royal Queen Seeds crossed Green Poison and Chile Indica and thereby created a very potent strain with an extremely short flowering period. Yields in the range of 475-525g/m². 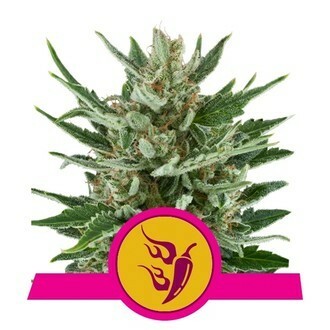 Speedy Chile "Fast Flowering" has been created for all growers who hesitate to cultivate autoflowering strains due the sometimes lower THC level. To convince even the last hesitator, Royal Queen Seeds decided to breed a very potent variety with an extremely short flowering period. They crossed Green Poison and Chile Indica and thereby created a plant that requires only 2 weeks of vegetative growth and 6 weeks of flowering to develop a high quality product with a THC level of 16%. Speedy Chile "Fast Flowering" is suited for indoor, outdoor and greenhouse cultivation. Indoors the plants rarely exceed a height of 100cm and yield in the range of 475-525g/m². In an outdoor plantation the height of the plants ranges from 130 to 160cm and each produces 450-500 grams, ready for harvesting in September, right in time before the rain in fall sets in. The buds of Speedy Chile "Fast Flowering" have an outstanding flavor and potency. This weed exhibits great medical value - it is ideal to treat pain, to help with sleep issues and is a natural appetite stimulant. The heady effect is less pronounced, but still uplifting, yet not to an extend that you can no longer function normally. Très bonne graines​, 5/5 ont germé et m'ont assuré une bonne récolte en moins de 2 mois, À recommandé. It is a very easy and fast growing plant. I grew mine in 11L pots with organic soil and nutrients. the smell is very sweet and fruity and the end, smelled like very ripe pineapple and has green mango taste (at least mine does) buds where not that big but where covered in crystals and where dense. It keeps me awake all night so if you are looking for a strain that puts you to sleep you shouldn't choose this one . at this moment I have : 1 mother plant in a 30L pot (4 months old) 4 clones in 0,5L pots 6 clones in 6L pots 2 other clones in 11L pots I'm keeping this strain around for a while. keep it green.